UN3291: Certified - lockable doors, doors sealed when closed, drip tray recess, impact resistant design. Fenders: Low level non marking rubber. Shelves: removable, large radius on leading edge to protect goods during loading, shelves slightly inclined to encourage contents towards the rear of shelf preventing poorly loaded items from falling out during unloading, two shelves supplied as standard, three effective load surfaces including trolley base. Drip Tray: 30mm recess trolley base to maximise retention of infectious waste, drain hole and plug supplied as standard. A4 document frame: inside and out. Castors: two swivelling with brakes, two fixed, non-marking shock absorbing tyre, water resistant industrial class. Tow bar: optional, for towing trolleys in series. 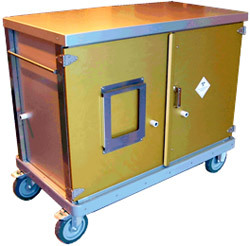 UN3291 Compliant: This unit meets the United Nations standards for packaging used to carry clinical waste by road.